Qatar’s economy has shown resilience since the imposed blockade on the country over a year ago, said QNB Group CEO Ali Ahmed al- Kuwari. 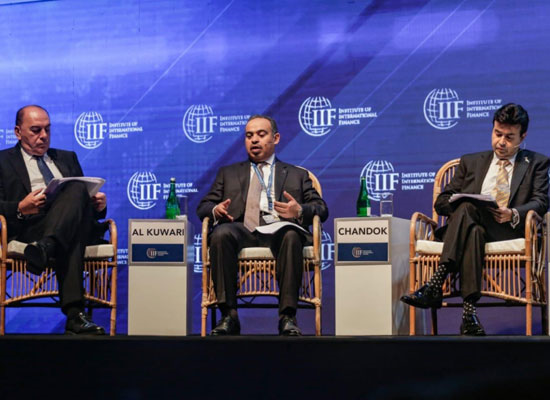 The country’s GDP growth of 1.6% in 2017 is expected to be followed by growth of 2.6% in 2018, al-Kuwari said at a seminar on ‘Views from the C-Suite: Global Outlook,’ held on the sidelines of the 2018 IIF Annual Meeting at Bali, Indonesia, recently. Al-Kuwari said that after more than one year, Qatar now regards the blockade as a ‘new normal’ for the region and is confident that the strong economic performance and resilience seen over the last year will continue. The non-hydrocarbon sector, which is now more than 50% of the economy, is continuing “strong” growth, al-Kuwari stressed, pointing out that a buoyant 5% growth in the non-hydrocarbon sector is expected this year after solid growth of 3.6% in 2017 despite the blockade. Drivers of non-hydrocarbon growth are the construction, trade and logistics, manufacturing and agriculture sectors. He also highlighted Qatar’s trade flexibility as exports have grown by 31% since the start of the blockade, with trade re-routes especially to India and Turkey but also through growing LNG demand from Asia. He described the Qatari financial system as healthy and resilient, noting that asset quality is high with NPLs at 1.6%. In this context, the QNB Group CEO said that the banking system is well-capitalised as Tier 1 capital adequacy was 16.5% in 2017 while profitability is also “high” with return on equity (ROE) almost 14% at Aa3, placing Qatar as one of the “highest rated sovereigns” in the world. QNB Group’s presence through its subsidiaries and associate companies now extends to more than 31 countries across three continents providing a comprehensive range of advanced products and services. The topics discussed during the seminar highlighted a few key issues, including economic and policy outlook and key risks for Asia and the global economy over the next year. Panelists also discussed their implications for financial markets and fund flows, as well as, the outlook for the emerging market economies. The event saw the participation of an influential audience of 500 policymakers, CEOs, market experts, and innovators in the banking, financial and economic sectors. Several senior industry leaders participated at the seminar, including Vijay Chandok, executive director, ICICI Bank, Martin Gilbert, chief executive, Standard Life Aberdeen, Jean Lemierre, chairman of the Board, BNP Paribas, and Axel A. Weber, IIF chairman and also chairman of the Board of Directors, UBS Group AG.